Tonight, I don’t like you very much, even though you’re my son. And, I thought about not documenting it, and writing it down for posterity and the whole internet. But that would just let my anger fester more. That is exactly why I needed to write it down. I think the reason I am so upset is that I am tired. I’m physically and mentally drained. I’m fighting the remnants of a cold, and the weight of existential depression. I have continued to move through it, to do my motherly duties, my work responsibilities, my church calling, supporting family members going through difficult times, helping in your classroom, and meeting with teachers and administrators about your needs. I keep doing, and pushing through it hoping that I will feel better, and knowing that if I take time to stop busying myself I will have to confront what is really bothering me. To be honest with you, and myself, and anyone else reading this, I’m probably not frustrated with you talking back. I’ve realized that when I’m really upset, and quick to lose my temper, that it usually isn’t just about you, and what you said and did. By the way, that’s not an invitation to do it again. I am frustrated right now. I want you to know that no matter how frustrated I am now with you or your behavior, I still love you. To love someone is a choice that you must make to move forward, and not dwell on annoyance, anger and frustration of the present. Someday, in addition to today, you won’t like me very much. There might be whole time periods of frustration even. Or, it might not be me with whom you’re frustrated. You might look at the person you chose to marry, and wonder how they manage to trigger your frustration so easily. That’s okay. You can still choose love them. The real measure of a relationship is not what you do on the days that you like a person. It is what you do all the other days. Sometimes, you might reflect wistfully upon past memories you shared together with the person you love, letting your rumination of the past be tinted rosier than the struggles of today. You might think of other relationships or times in your past which seem better than today in comparison. 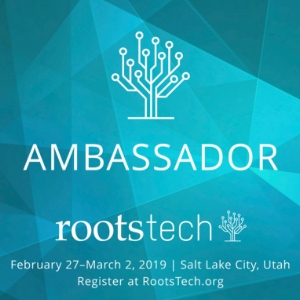 As a genealogist, I spend a lot of time looking back, and reflecting on the past. I know that it is a natural response to look gaze at the past with fondness and nostalgia. I do it as a parent even…thinking about you when you were so tiny, and needed my constant care and attention. I forget about your acid re flux, that potty training you was especially difficult, medical issues, or any one of the other mundane frustrations that come with the early years of parenting. The past gets filtered through the lens of time and distance, and becomes more appealing. Revisiting memories can sometimes seem better than your frustrations of today. It is hard for me to remember that tomorrow, this moment of frustration, no matter how infuriating it seems today, will be in the past. Time will soften the edges, and it probably won’t be a very big deal. It will blend into memory. It is harder for me to be present in this moment now, today, than to reflect on my past or dream about the future. The present forces me to acknowledge my flaws and faults… my humanity. Being present requires me to see my life as it is rather than how I hoped it would be, or how it has been before. Sometimes, I don’t like what I see. It is easier to escape, or blame others in my frustration than to acknowledge my present. I can not always choose what happens in my life. I can always choose how I see the situation, and how I respond. Thank you for being my son, and for giving me so many opportunities to choose joy, and to look for the good in today, and to work on becoming the woman I hope to be. 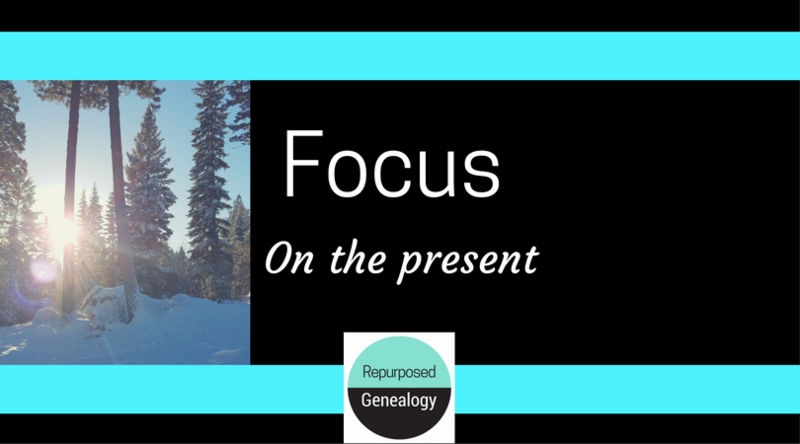 Genealogy Jen’s Challenge of the Week – What do you do to stay focused on enjoying the present? Comment, and let me know. What do I do to stay present? I breathe. Really, we’re all in this existential angst right now. Today I felt my head beginning to clear, but it’s been weeks of chaos and stuff and pressure and getting things done and forgetting things and having arguments with my husband. Whom I dearly love. He’s it. No kids in the house other than a grown son who simply returns to the basement when I get cranky. So there you are. I expect writing helped you work some of it out. I hope the hug I send electronically will help with the rest. J.
Oh, you hit a chord there. I’m not angry with anyone specifically, just the world in general. I would like us so much to get along and all I hear around me is so much bitterness and anger. Love comers a multitude of sins and I’d like us all to remember that. Beautiful! I stay present by having little to no regrets for mistakes of the past, working on forgiveness, as well as working on peace and contentment with current situations even if there are future goals.